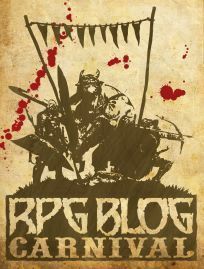 This month’s RPG Blog Carnival is being hosted by James Introcaso at the World Builder Blog and is entitled Homebrew Holiday Gifts. The topic is giving a gift of your gaming creations. I’ve had the idea to start a series of “Two Sheet Locations” and having just finished the first one, I thought it would be a great entry into this month’s carnival. So without further ado, I present you with Mr. M’s Equipment Emporium. The Equipment Emporium is owned by Mr. M. No one knows his real name. Even the documents registering the store simply list the owner as Mr. M. He is a single, middle-aged man with a lean, wiry build. He is on the shorter side but looks like he can handle his own in a fight if necessary. Born and raised on an outpost world, Mr. M was grabbed by a wanderlust at a relatively young age and decided to see the galaxy. He has worked as a laborer, a mercenary, an explorer, and a quartermaster on a starship. His wanderlust satiated, Mr. M put his knowledge of the spaceways and equipment together to open the Equipment Emporium which he has run for the past couple of decades. An expert marksman with both projectile and beam weapons, he is also proficient in melee and unarmed combat. He has excellent survival skills (although he doesn’t use them much on-board the space station where his store is located). He has basic medical skills as well as deep understanding of both the human and alien psyche which he puts to good use in helping customers find exactly what they need in his store and convincing them that they need it. Mr. M is good-natured and generally easy-going. He has no end of stories which he uses to regale his customers with while showing them merchandise from his store. He also has a ready ear and a good story can get you a better deal on just about anything he is buying or selling. Mr. M drives a hard bargain but isn’t pushy. He’d rather have a customer leave with a good experience than make a sale. He always wears a laser pistol at his side, even, or maybe especially, when working in the store. The first thing you notice when approaching the Equipment Emporium is the large glowing neon sign over the entryway with Mr. M’s name glowing blue in the middle and the words Equipment Emporium emblazoned in red around it. It lights up the passage way for tens of meters in every direction. The building extends all the way to the station level’s ceiling. Directly inside the door to the right is a display case that doubles as the sales counter along with several display cases behind the counter. The counter contains a variety of small, valuable objects and the cases behind the counter contain mostly weapons. Otherwise, the store primarily consists of a large room that is well lit and lined with shelves with larger aisles between the shelving than you would expect for a store on a space station. Looking into the aisles, however, one sees that the extra space is needed as some of the items are quite large. Each aisle is clearly labeled with the type of items they contain. However, the labels don’t always make sense to the casual observer as they are as often locations or regions as types of items. Mr. M knows where everything is and the labeling is more of a memory aide for him rather and a wayfinding guide for customers. Beyond the counter and on the same side of the building is a locked room that contains some of Mr. M’s more expensive items. This lock is actually a three-factor voice and biometric recognition lock that requires the speaking of a code phrase in Mr. M’s voice and a successful hand print scan to open. Mr. M changes the passphrase regularly. This can only be done from inside the room. The room holds a few rows of shelves containing items that Mr. M feels need a little more security and could range from power weapons to rare artifacts to priceless gems and jewels. 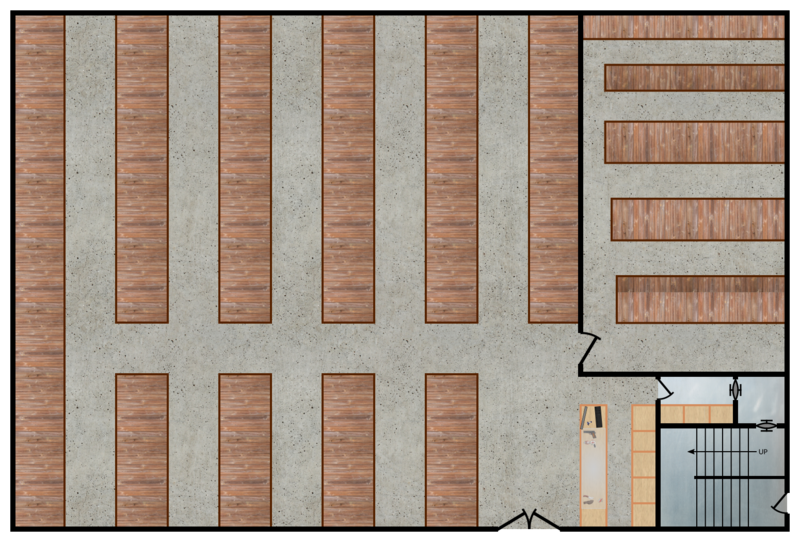 The aisle nearest the door is a little larger than the other to provide space for larger items. There is a final door behind the counter that leads to a stairwell that goes up a level in the station to Mr. M’s private living quarters on the upper level. This is actually fairly unique on station as typically the residential section is completely isolated from the business section for station integrity. Because of this, beyond the normal looking door is actually an airlock chamber that you have to pass through to get to the stairs that lead up the Mr. M’s residence. This was a requirement he had to satisfy in order to have the cross level access. How he got the access, however, is a complete mystery. His residence is fairly small but very well appointed with décor and artifacts from across the galaxy that he collected in his wanderlust years. The front room is obviously for entertaining guests and heavily decorated with his “trophies”. To the side is a kitchen/dining area and there are two additional rooms plus a bathroom. One room is Mr. M’s bedroom and the other contains a high tech holovid entertainment system. Mr. M tends to deal with more esoteric and unique items, leaving the common goods for the other outfitters and pawn shops. If you have or are looking for a unique item, Mr. M’s is a good place to check out. If all you have is standard issue material, it had better have a great story behind it or he won’t be interested or won’t be carrying it. Mr. M has a fine eye for the value of everything that goes through his store. If he’s selling, he typically quotes a price about 5% above the item’s value. If the buyer has a good story or a personal connection in some way to the item, he’ll typically knock that 5% off right way. He doesn’t mind haggling at all but will typically only go down to about 90-95% of the item’s value. To get him to go below that would take an extraordinary story or skill but he will never go below 85%. If he’s buying, he’ll absolutely want to know the story behind the item as he deals as much in the stories as in the items themselves. Plus it allows him to ascertain the provenance of the item and better assess its value. He doesn’t typically deal in illegal items (but he’s a sucker for a good story) and the history gives him a feel for this aspect as well. If he’s interested in the item, he’ll typically make an offer that is equal to 60-65% of the item’s value, which is typically higher than other dealers would offer. He’s willing to take smaller margins in order to generate goodwill and repeat business. Again he’s more than willing to haggle but will not typically go above 70% of the item’s value and will never go above 75%. While good-natured, he also doesn’t suffer fools lightly. If anyone makes dumb or outlandish demands on prices, he will simply terminate the transaction. On the other hand, if the customer makes a counter offer within his price bracket, he’ll good-naturedly try to haggle them down a percentage point but once they give just a little he’ll accept the offer. Mr. M will also just give an appraisal if the customer wants. For a good story he’ll give his assessment for free and it will be within 30% of the true value. If the customer wants a little more research into the actual value, Mr. M will be willing to do it for a small fee (typically a flat rate or 1% of the value whichever is less). This estimate will be ready in 1d3 days and be within 5% of the true value. Characters should start hearing about Mr. M long before they ever get to the system where he runs his shop. He doesn’t advertise but everyone knows about him and his store, even several star systems over. He has a towering reputation as a great story teller and a fair shopkeeper and is a bit of a local legend in his part of the galaxy. There are any number of reasons characters may want to visit Mr M’s store. They have something to unique to sell. Other dealers don’t see the value and are seriously under valuing the item. Mr. M has a reputation for a keen eye and good prices. They have an item and have no idea of its value. They hear that Mr. M knows his stuff, doesn’t ask much for the service, and is uncannily accurate in his appraisals, even on items from the far reaches of the galaxy. There is something they need. Maybe they’re tracking down an item and the trail leads to the store. Or maybe just to the system where they get word of Mr’ M’s as the place for unique items. They’ve heard of Mr. M’s reputation and just want to meet this character themselves. While designed for a sci-fi setting, Mr. M and his shop could be easily adapted to a fantasy game with just a little modification. The full size maps are drawn at 100dpi and 50 pixels (1/2 inch) = 1 meter. There is no grid but I could easily add one if desired. 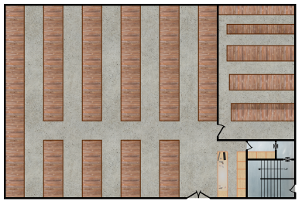 This is the first in an on-going project of various locations designed to be dropped into your game as needed. I’d love to hear feedback on what works and what doesn’t and what kind of things people would like to see in the future. What kind of other details would be useful to you in using such a location? Also let me know about the maps. Do you feel they are too busy? Just right? 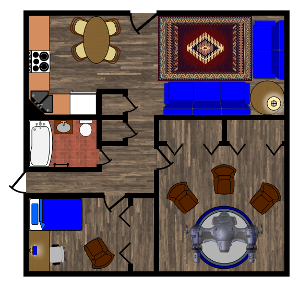 Would simpler floor plans be better?